Montreal-based percussionist Ben Reimer has been called a “genre-bending wiz” (PuSh) establishing himself as a leading figure in contemporary drumset performance. 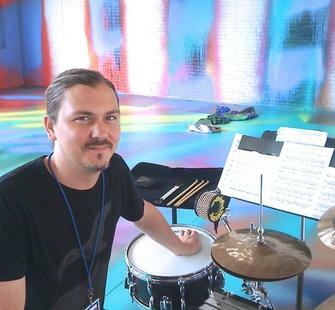 He has spent the past fifteen years exploring a new role for drumset in the context of through-composed music. For the past decade Ben has collaborated with award-winning Canadian composer Nicole Lizée. He has premiered four of Nicole’s concertos as well as multiple chamber works, recordings such as Bookburners and This Will Not Be Televised (Centredisc) and solos such as the influential “Ringer” for drumset soloist. Ben Reimer’s album Katana of Choice: Music for Drumset Soloist was released in September 2018 on Redshift Records (Vancouver). Described as “an exhilarating musical ride” (Wholenote) the album features music by Nicole Lizée, Eliot Britton, John Psathas and Lukas Ligeti. Guest musicians include David Cossin (performer/producer), Architek Percussion and TorQ percussion Quartet. Ben is an Adjunct Professor at the Schulich School of Music, McGill University. He is a member of Architek Percussion, Want Slash Need, SaskPwr and is a Sabian Cymbals, Yamaha Canada and Vic Firth artist.